Colombo should also put an end to the controversial colony being created at Kaayaa-kuzhi in Musali where Sinhala fishermen from South, the politicians resolved. Colombo’s Director General of Department of Fisheries & Aquatic Resources (DFAR), which functions under the purview of the Fisheries Ministry, has recently instructed the Divisional Secretary of Musali Division in Mannaar district and the Assistant Director of Fisheries Department in Mannaar to put up a colony for fishermen from South at Kaayaa-kuzhi. Further, the SL military running a restaurant business named ‘Rice Bowl’ near Giant’s Tank on Mannaar – Mathavaachchi Road should close down the operation and hand over the facility to civil authorities in Mannaar, the DDC meeting resolved. The restaurant run by genocidal military has been causing environmental and social problems. 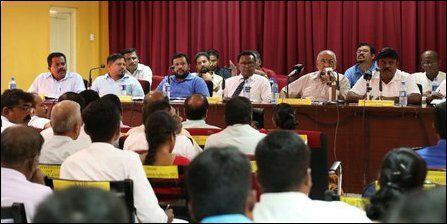 Hundreds of hectares of lands have been seized by Colombo in the DS divisions of Musali, Madu and Naanaaddaan during the past 4 years. These lands should be handed over back to people and necessary changes should be announced through Gazette notifications, the DDC meeting resolved assigning the task of identifying such lands to the divisional secretaries of the three divisions. The official representing the Forest Department was defending the land grab. However, the DDC meeting instructed the official to immediately suspend planting border stones in the disputed areas. 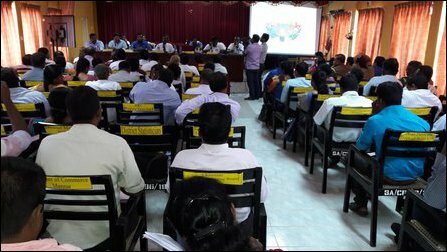 Several interest groups of Mannaar fishermen were pushing for immediate action to stop Sinhala colonisation at Kaayaa-kuzhi in Musali division. It was pointed out the move was completely new to Mannaar district. The practice was only temporary stay during seasonal fishing. There has never been a precedence of creation of a colony. The move will be disturbing the ethnic harmony in Mannaar, they pointed out. The Assistant Director of Fisheries Department in Mannaar was absent. However, the meeting resolved to urge SL President Maithiripala Sirisena to suspend the controversial settlement. 13.09.16 Sirisena's Forest Department escalates appropriations of lan..
23.08.15 Colombo's Wildlife Department harasses Eezham Tamil villager..
12.05.15 NPC Minister demands de-militarisation of Chu'ndiku'lam Bird..
30.06.12 20% of Mannaar faces genocidal land grab, TNA activists to p..